The fact is, we find that our current private loan partners and associated loan programs offer lower overall costs for our students than the Direct Plus Loans from the US federal government. Federal loan programs, while definitely beneficial, are not the beginning and end of sound financial choices for graduate students that they once were. Several years ago, the federal government changed the graduate student loan programs, increasing overall cost and ultimately decreasing availability. The Direct and the Direct Plus Loans for graduate students no longer enjoy subsidies available on undergraduate loans, which means the government is no longer making interest payments. Other changes include increased fees (including origination fees, 1.069% for Direct, 4.276% for Direct Plus), higher interest rates (5.31% for Direct, 6.31% for Direct Plus), and more stringent credit requirements for the Direct Plus program; this is particularly critical for medical students because the Direct Loan, with its lower fee and lower interest rate, limits overall borrowing to $20,500.00 annually. This puts additional loans as a near-inevitability for medical students, even those at highly affordable schools. At that point, the options are private borrowing or the Direct Plus Loan, an additional federal program. The Direct Plus Loan carries loan limits based on the schools cost of attendance and imposes the larger 4.276% loan origination fee. With these changes, the cost of borrowing federal loan money for medical school has increase significantly, especially in light of the larger loan amounts and extended repayment periods prevalent in medical education. In summation, this means that with the restriction on loan amounts for the Direct Loan program, Direct Plus is used more frequently as it provides significantly larger loan amounts. This means students pay a disproportionately higher level of fees and interest on their overall loan portfolio. Even with all of that taken into account, the credit-worthiness threshold is high enough that students with adverse credit records may not be approved for a Direct Plus Loan at all, or may have to secure a co-signer to gain approval. The bottom line is this: our private student loan programs provide significant advantages and money saving opportunities that do not exist with federal loan programs. 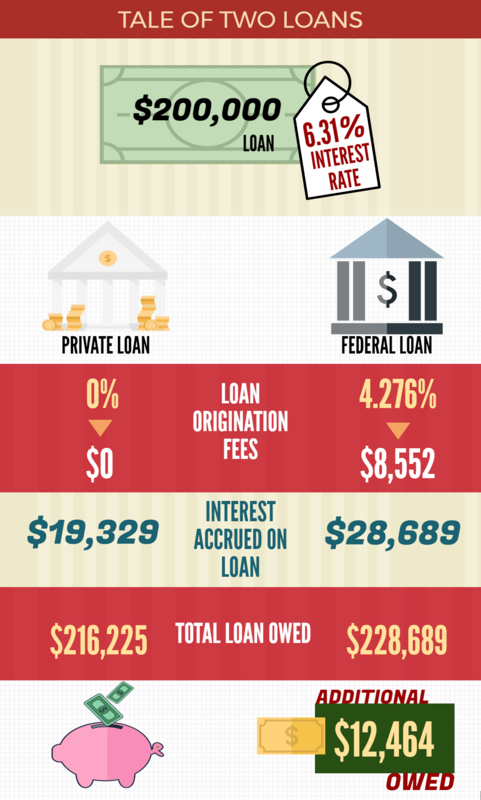 As we've said, public perception is that federal loans having a lower interest rates than private loans. This is based on experience gained in undergraduate and/or with previously subsidized loans. Graduate school is an entirely different animal and deserves careful inspection before taking on any debt. First, depending on a credit profile and score, our private programs offer variable rates as low as 2.5% and fixed rates as low as 5.74%, which is noticeably lower than, and easily competitive with, federal rates and plans currently offered. Next, there's the hidden cost of the loans themselves and federal origination fees. Quoted interest rates for federal loans may appear attractive on first blush, but loan origination fees can significantly alter the "effective APR." At present, federal loan origination fees on the most frequently used Direct Plus program will increase the loan amount by 5% for every loan disbursement. 5% may not seem significant until the impact over time and interest are applied. Based on the example above, a $20,500.00 Direct Plus loan at 6.31% interest over a forty month period would perform (yield interest) similar to a $20,500.00 loan (without loan origination fees) at a 9.45% interest rate. The origination fee alone adds 3.14% to the effective APR. Beyond that, there's consideration of post-graduation cost and entering repayment. Borrowers using private loans from one of our partners at $200,000 at 6.31% results in $2469.00 per month on a 10 year repayment plan. A Federal Direct Plus Loan for $200,000 at 6.31% interest rate will carry payments of $2575.00 per month over a 10 year repayment plan. This increased cost is what happens when you add $8,552 in loan origination fees to the principal amount and $808.00 of accrued interest on those origination fees. This additional $106.00 per month in additional payments will cost almost $12,645.00 more over the life of the loan. No matter how you slice it, medical school is a significant investment in your future. 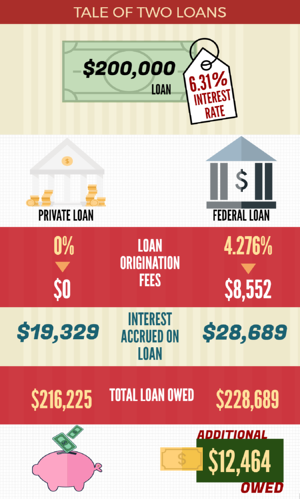 So why pay almost $13,000.00 dollars more for a Federal loan for your education. This means that Trinity students are able to securely invest in their future and ultimately pay less - not just because there are no hidden fees, but because the cost of the loan is lower, depending on the size and length of the repayment, significantly lower. Tuition costs keep rising. And at Trinity School of Medicine, we’re doing everything we can to offer a fulfilling academic experience that leaves students confident in their decision and prepared for the next steps in their career in medicine while we also keep costs low. Medical education is at the crossroads of a crisis: the physician shortage is demanding more and more doctors, while at the same time, costs and competition are getting out of hand in the US and Canada, limiting the chances of those ready and eager and qualified to respond to that dire need. It’s why we’re here, it’s why we’re doing things differently. Our approach is to look at what really works and what doesn’t, but especially to look at what has been stigmatized and dismissed and see what’s actually there. If there is an opportunity for medical students out there that is being ignored (properly structured and prudently implemented private loans, for example) because that’s just how it’s always been, we will seize that opportunity and provide it for our students to give them the best opportunity. At Trinity, we strive to be the top Caribbean medical school choice for medical students. If you'd like to learn more about our tuition, loans, and scholarship opportunities, you can click any of those links. If you have any questions, we're always here, so feel free to reach out. We'd love to meet you and talk about your future in medicine. *Rates for the Federal Direct Plus Loan changes each year based on current economic conditions. Rates for the private loan programs change at various times during the year based on economic conditions. Rates for loans two years ago could be much higher or lower than rates for the current year. These numbers represent the conditions at time of publication.